The picturesque medieval city of Bruges (Dutch name: Brugge), Belgium is a popular choice for day-trippers from the Netherlands, and is just a few hours journey from Amsterdam. There are several ways to travel between the two cities. Travelers can take the Thalys train to Bruges with one transfer in Bruxelles-Midi. When you travel on this train you are permitted one item of hand luggage and a maximum of two pieces of luggage to be placed in the baggage compartment. There is an opportunity to purchase food onboard at the Thalys Welcome Bar. If you are traveling in Premium, meals are included on your ticket and are served at your seat. The journey between Amsterdam Central Station and Bruges takes three hours. Note that prices rise as the date of departure nears. Tickets can be booked at the NS Hispeed website. International coach is the most affordable option for travel between Amsterdam and Bruges. At five hours, the bus may take a full two hours more than the train, but is considerably cheaper; Eurolines offers fares each way. (Note that coach fares are also apt to rise as the departure date draws closer.) The Eurolines Amsterdam stop is situated outside of Amsterdam Amstel Station, some 10 minutes by train from Amsterdam Central Station; the Bruges stop is conveniently located in front of the city station, at ​Busstation De Lijn on Stationsplein.​​​ Eurolines allows a carry-on bag and two suitcases that can be stowed underneath the bus with each ticket. FlixBus is another company that serves this route. You can book your trip directly with their app on your phone, on the website, travel agencies, or with the driver. With your ticket you can bring one item of hand baggage. You can also bring one piece of luggage to be stowed underneath the bus. There is Wifi on the bus. Families, mobility-impaired travelers, and others may wish to drive between Amsterdam and Bruges. The 155-mile (250 kilometers) drive takes about three hours. Choose from a variety of routes, find detailed directions and calculate trip costs at ​ViaMichelin.com. 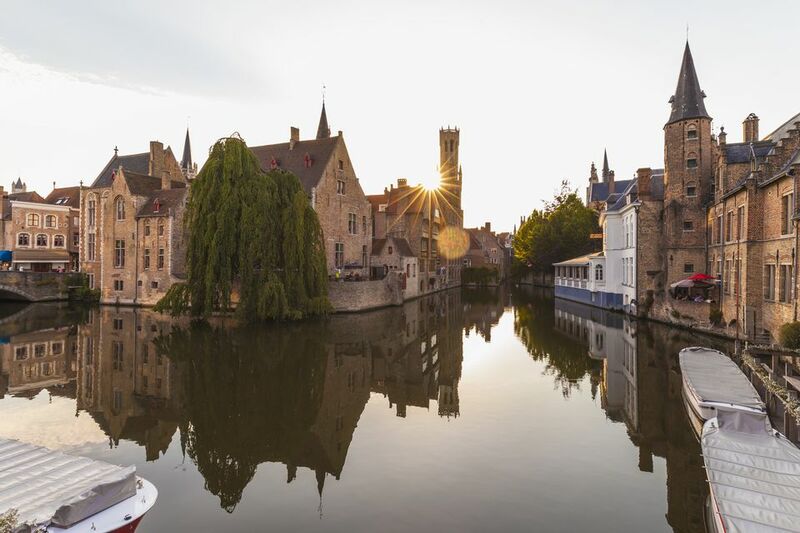 Discover more about the city of Bruges with this Bruges Travel Guide, which features practical information and must-see attractions, and then find out where to stay. A self-paced tour is outlined in this Walking Tour of Medieval Bruges. The beautiful medieval center of Bruges is remarkably well preserved and is a UNESCO world heritage site. Bruges is also an art city. Renowned Bruges painter Jan van Eyck (1370-1441) spent most of his life in Bruges. The Groeninge Museum is an ideal place to visit to get a sense of the art history of Bruges. The museum houses some well-known Flemish art. Belgium is known for beer and Bruges has an interactive beer museum called The Beer Experience located in the historic center of town. You'll learn about Belgium’s famous beer making heritage and about the monks who were early brewing innovators.There's also a special non-beer exhibit just for kids, and a tasting room with more than a dozen Belgian draught beers for the adults. How Can I Get From Amsterdam to Dusseldorf?